Welcome to the third Halloween Mix! 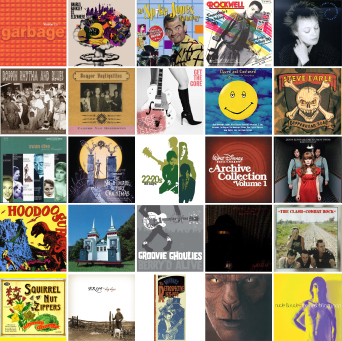 Some more by artists from previous Halloween mixes (the Clash, Robyn Hitchcock, Squirrel Nut Zippers, They Might Be Giants), plus plenty that appear here for the first time: Laurie Anderson, Cozy Cole, Garbage, Hoodoo Gurus, Rockwell, Spike Jones, Swan Dive, and many more. Panic! at the Disco cover “This Is Halloween,” on the “Special Edition” CD of the soundtrack to Tim Burton’s The Nightmare Before Christmas. A confession: I’m very obsessive-compulsive about mix-making and had original started this mix with AC/DC’s “Hells Bells” (from Back in Black), but decided that this track might make a better opening. Since this is an on-line mix, of course, you should feel free to cue up your own copy of AC/DC if you’d prefer the mix that way. After all, I’ll never know! Yes, this is the song sampled by M.I.A. for “Paper Planes. ” It’s from the last proper Clash album, Combat Rock (1982), which included the big hit “Rock the Casbah” and the smaller hit “Should I Stay or Should I Go?” I say “the last proper Clash album” because, although there was Cut the Crap (1985), Mick Jones had departed the band at that point and Joe Strummer himself (who is on the album) largely disowned the record. From Earle‘s third album, Coppherhead Road. From BR5-49’s most recent album, Dog Days. Jazz drummer Cozy Cole (1909-1981) takes a turn on vocals. The voice of Tony the Tiger (that’s him saying “They’re grrrreat!” in the Frosted Flakes commercials), Thurl Ravenscroft (1914-2005) gave his best remembered performance as the singing voice of the Grinch, in the 1966 animated adaptation of Dr. Seuss’s How the Grinch Stole Christmas! However, the credits list only Boris Karloff (the Grinch’s speaking voice) and not Mr. Ravenscroft. In a DVD extra to a recent reissue of the TV special, Ravenscroft says that Seuss apoogized for the omission — and that Ravenscroft has no hard feelings about the matter. To learn more about Ravenscroft, I highly recommend Brian E. Jacob’s website All Things Thurl. After a decade-long hiatus, John Fogerty released Centerfield in 1985, following that up swiftly with Eye of the Zombie in 1986. Though the latter album did not sell as well as its predecessor, Centerfield was a huge hit — “Old Man Down the Road,” “Rock ‘n’ Roll Girls” and “Centerfield” all charted. And Eye of the Zombie has its pleasures, such as the title track — the video to which is below. Camper Van Beethoven cover Hank Williams. This track first appeared on the band’s album of odds and ends, Camper Vantiquities (1993), but was recorded during the sessions for Vampire Can Mating Oven (1987). From Get the Gore, the Gore Gore Girls‘ third album. With a guest vocal by Michael Jackson, Rockwell’s song hit #2 on the pop charts in 1984. Below, the song’s video. The second single from Garbage‘s second album, Garbage 2.0. The first track from Black Sabbath‘s second record. Ozzy Osbourne on vocals, Tony Iommi on guitar, Geezer Butler on bass guitar, and Bill Ward on drums. Below, the band’s music video for this song. From Berry’d Alive, the band‘s EP of Chuck Berry covers. From St. Elsewhere, the debut album of Gnarls Barkley (Danger Mouse and Cee-Lo), featuring the hit single “Crazy.” I’m very much looking forward to Cee-Lo‘s new solo record, The Lady Killer, due out November 9th. From Pop‘s The Idiot, which also featured “China Girl” — later a hit for David Bowie, who produced and co-wrote all of the songs on The Idiot. From the band‘s single 22 Days. Long before there was “Weird Al” Yankovic, there was Spike Jones, whose energetic, merrily anarchic covers of popular songs were hits in the 1940s. The Zippers‘ follow-up to Hot ventured a little further afield musically than its predecessor, and did not do as well commercially. But Perennial Favorites included a lot of great songs, including this tribute to songwriter Stephen Foster. From You’re Beautiful, the first album by Nashville-based duo of Bill DeMain and Molly Felder, a.k.a. Swan Dive. I highly recommend the record and, indeed, Swan Dive in general. I’ve not been keeping up with their career as closely as I should (I don’t have the latest couple of CDs), but I enjoy all the Swan Dive CDs I have. From Strange Angels (1989), Anderson’s most accessible record and one of her best. In my humble opinion, the two greatest Laurie Anderson records are Strange Angels and Big Science (1982). Jenny Lewis recorded Rabbit Fur Coat with the Watson Twins. You’ll also know her as the lead singer of Rilo Kiley, and for her other work — her solo record, and Jenny & Johnny, her new album with Jonathan Rice. This is the recording that Moby samples on “Run On” (from his 1999 album Play). Many other artists have recorded the song, including the Blind Boys of Alabama (on Spirit of the Century), and Johnny Cash (as “God’s Gonna Cut You Down” on American V: A Hundred Highways). That’ll be all for this week. Next week, it’s Halloween Mix IV, followed closely by Halloween Mixes V, VI, and VII. Enjoy! Another great bunch, thanks! I like that version of Old Man Mose (and of course the TMBG song.) Swan Dive is totally new to me, so that song is a real bonus.